Welcome to the IMAGINATE STUDIO website. 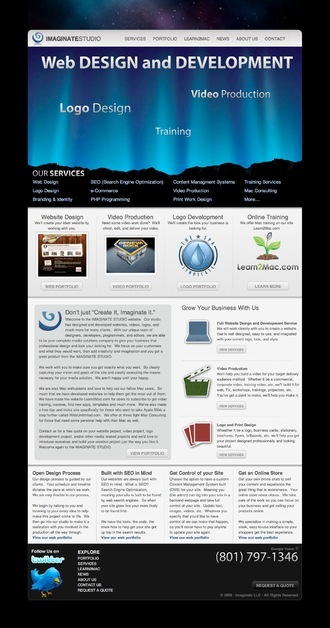 Our studio has designed and developed websites, videos, logos, and much more for many clients. With our unique team of designers, developers, programmers, and editors, we are able to be your complete media solutions company to give your business that professional design and look your looking for. We focus on your customers and what they would want, then add creativity and imagination and you get a great product from the IMAGINATE STUDIO. We work with you to make sure you get exactly what you want. By clearly capturing your vision and goals of the site and clearly executing the means necesary for your media solution. We aren’t happy until your happy. We are also Mac enthusiests and love to help out our fellow Mac users. So much that we have developed websites to help them get the most out of them. We have made the website Learn2Mac.com for users to subscribe to get video training, courses, find new apps, templates and much more. We’ve also made a free tips and tricks site specifically for those who want to take Apple iWeb a step further called iWebUnlimited.com. We offer at times light Mac Consulting for those that need some personal help with their Mac as well. Contact us for a free quote on your website project, video project, logo development project, and/or other media related projects and we’d love to introduce ourselves and build your creative project just the way you like it. Welcome again to the IMAGINATE STUDIO. Welcome to the Imaginate Studio. We specialize in Web Design and Development for all types of web projects. Visit our website at www.imaginatestudio.com for more info.